By Xah Lee. Date: 2015-11-01 . Last updated: 2016-07-04 . 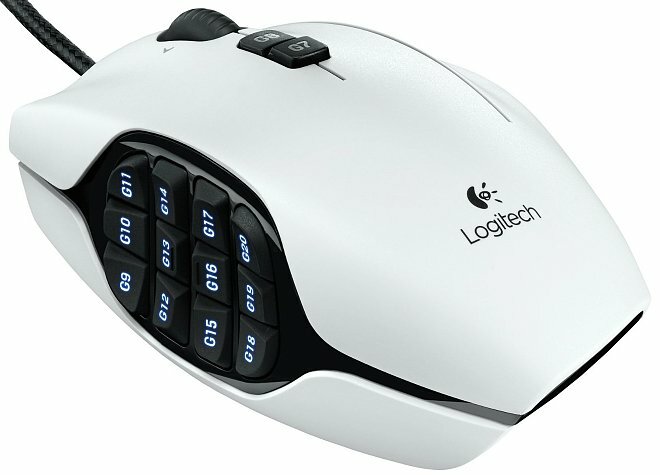 This one, is solid, by Logitech. It came out in 2012 June. In reviews, many prefer this than the Razer Naga. The mouse size is wide. I'm Asian. I have small hands. I'm a fingertip-grip guy. 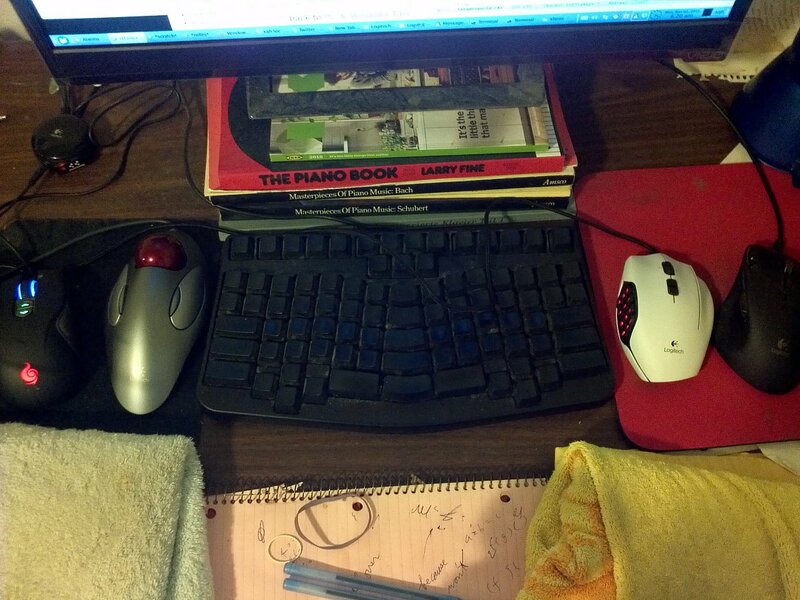 For this mouse, i had to use palm grip because of its width. The g-shift button on the right forces you to put your ring finger there. There is a button on the right side. That's the G-shift button. It is clicked by your ring finger. This button, can be used as a button by itself. For example, you can set it to do middle-click. Because, middle-click with the wheel is difficult. Or can be used like a shift key, which makes the other buttons do different things. Using it as g-shift is no good. Because, having a gaming mouse with extra buttons is exactly to reduce key-chords. I don't want to do hold-this-then-press-that complexity, and causing Repetitive Strain Injury. Setting the G-shift button as middle-click is excellent! The side buttons are usable. But takes some effort to press, in comparison to gaming mouse with much fewer buttons. Given a choice, i'd rather have a extra gaming keypad or gaming keyboard's extra programable keys. 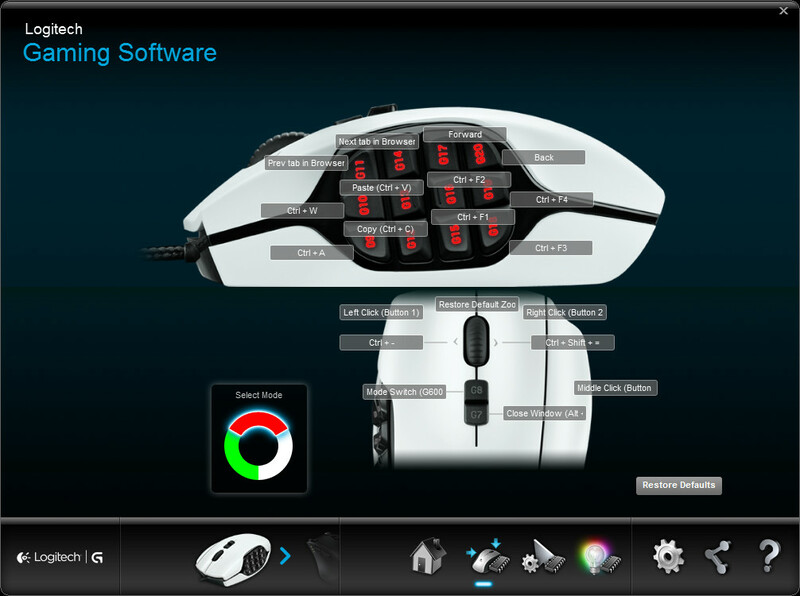 Or, i rather have a FPS mouse with just 5 extra buttons for custom functions. The wheel is very well-designed. It's easy to scroll. You can place one finger on the wheel, not touching mouse elsewhere, roll it, without moving the mouse. Yes, the mouse stores key settings in the device. This means, you can setup the keys, and use this mouse on any computer, without needing any software. I use it in Linux. The logitech software is truly excellent, as usual. It's extremely easy to use and intuitive. The scroll-wheel, left/right tilt, is now zoom in/out. click wheel to go default zoom. The ring-finger button, is now middle-click. Great to open link in new tab in browser. I got this mouse for programing work. For browsing website actually, because i do lots research, reading docs, typically having 20 tabs in 3 different browsers. One thing i was looking is to set a drag lock. That is, drag-n-drop without needing to hold the button. But i didn't find this feature in the software. Also, there's no sound-level up/down command. Strange. That function is available in Logitech G700s Mouse's software. There's rainbow of colors you can set. Each mode can have 1 setting. The only place that lights up is the keypad key labels. You can have breathing effect, or cycle thru colors rainbow effect. You cannot set each key's color independently. Out of the box, without any software, it works (and works in Linux). There are 3 modes. Press the G8 button to cycle. Each mode, has different default key setup for side keys and other special keys. True, there are too many buttons jam'd into one place. But i wouldn't take point off that, because MMO mouses are like that. Set the buttons once, using Microsoft Windows, then use this mouse anywhere. I use it on linux. Everything about this mouse, quality, construct, software, features, mouse wheel, are top-notch.